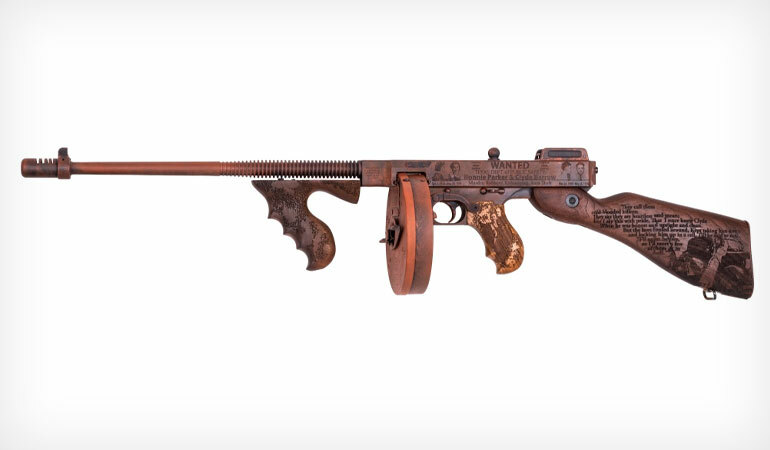 Thompson Auto-Ordnance, maker of the "Tommy Gun" and other classic firearms throughout history, introduces the "Bonnie and Clyde" Thompson. The Roaring Twenties created fame and notoriety for a new breed of outlaw. These “motorized bandits” roamed open roads, committing crimes and engaging in battles with lawmen devoted to their capture. Perhaps the most famous among them were the outlaws Bonnie Parker and Clyde Barrow. These two criminals committed a long string of murders and robberies, ultimately leading to their demise in a fiery ambush by law enforcement officers. Despite their evil ways, both bandits became symbols of the time period and earned a role in American popular culture including multiple film portrayals. Auto-Ordnance continues the legend with this custom finished and engraved “Bonnie and Clyde” Thompson. Each of these Tommy Guns are engraved with reminders of the outlaw duo’s escapades, including photos, a wanted poster, and news headline. The stock features text from Bonnie’s famous poem, “The Trail’s End”, foreseeing their crimes would not pay. The grip is engraved with the badge of the Texas Rangers, in commemoration of the legendary Frank Hamer’s leadership stopping the outlaws. The finish is a Cerakote “rusted” look. Underneath is an all steel, 18” barreled, 1927 pattern Thompson, chambered in powerful .45 ACP. The stock, forearm, and grip are Walnut. 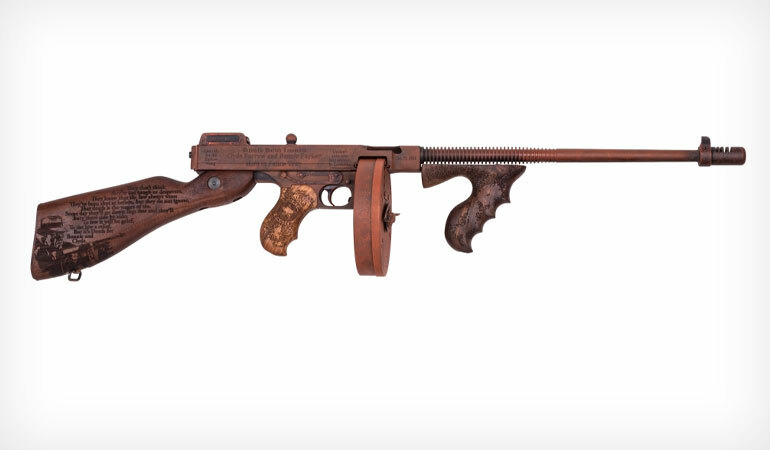 The Auto-Ordnance “Bonnie and Clyde” Thompson gives today’s shooter a chance to own a custom piece of American history, and experience legendary shooting performance with every trip to the range! The “Bonnie and Clyde” Thompson (T150D-BNC) has an MSRP of $2,583 and comes with a 50-round drum and 20-round stick magazine. Contact your local firearms dealer to purchase. Now shipping. Kahr Firearms Group and Outlaw Ordnance worked closely together on the “Bonnie & Clyde” Thompson and other custom projects. Outlaw Ordnance, based out of West Monroe, Louisiana, is a growing firm, changing the firearm industry with custom designs and innovations.